Once upon a time, the only way you could wear your favorite team's jersey was when its general manager signed you to a major league contract and the clubhouse attendant hung one in your locker before the game. In those days, it was difficult to impossible to buy replica jerseys. At one point, the Yankees even resisted the notion of replica caps. When a promotions manager suggested to George Weiss that the team hold a giveaway cap day in the 1950s, the New York general manager reportedly replied, "Do you think I want every kid in this city walking around with a Yankees cap?" Thankfully, attitudes had changed by the 1980s, when teams wised up and replica jerseys became more readily available. The first replica jersey I bought was a 1983 Giants road jersey with the great interlocked SF logo on the chest and "Clark No. 22" on the back. This turned out to be a great investment because shortly after Jack Clark left the Giants, Will Clark took his number. My Clark No. 22 jersey was good for many more years. And now, replica jerseys are so prevalent that teams are changing their uniform designs and wearing alternate tops simply to sell them and squeeze more money from fans. This widespread popularity, however, necessitates some NFL-like rules about when, where and how to wear your jersey. 1. Beware where you wear. Replica jerseys are always appropriate at the ballpark or softball field. They are fine for the living room or the backyard, as well, though your spouse might not always agree. Sports bars, taverns and pizza joints work, too, depending on your demographics. (See Rule No. 2.) But not every venue and situation is acceptable. Do not wear a replica jersey on a date (unless you don't want to go on another one). Do not wear a replica jersey to a nice restaurant (i.e., one that doesn't offer unlimited waffle fries). Do not wear a replica jersey to a church, mosque or synagogue. (Ballparks are the only appropriate cathedrals for jerseys.) And never wear a replica jersey to a wedding, unless, of course, that wedding is at a ballpark. 2. Fans of a certain age … Hey, I'm not telling you not to show your support for your favorite team. I'm just saying that when you reach your 30s, your spouse just might be right: You run the risk of looking like a literal closet case when you wear a replica jersey anywhere other than an athletic event. It's a bit like wearing your old high school letterman's jacket. But don't throw the jerseys away, either, no matter what your spouse says. Given enough decades -- say, sometime after you reach 60 -- you won't look like a sad sack in a replica jersey anymore. Instead, you'll appear refreshingly passionate, hip and years younger. 3. Get the look right. They're called replicas for a reason: They're supposed to replicate the actual jerseys that players wear. It's bad enough having to stare at all those Yankees fans wearing replica jerseys. But for goodness' sakes, don't make the rest of us look at Yankees jerseys that aren't even accurate. The Yankees do not have names on the back of their jerseys! Same goes for old Red Sox road jerseys. There is nothing that makes a fan look more clueless than wearing a jersey with Jeter, Sabathia or Yastrzemski written across the back. 4. Players only. The only thing worse than seeing a player's name on the back of a Yankees jersey is seeing a fan with his own name on the back of a jersey, as if the wearer is actually eligible for a postseason share. It might be a well-intentioned gesture to give a family member a jersey with the recipient's name on the back, but to actually wear it in public can make you look like a dork. Just don't do it. You're a fan, not a player. The only time your name should be on the back of a replica jersey is if the last name on your driver's license is Mauer, Verlander, Cabrera, Ichiro or the name of some other actual player who wears that jersey. 6. Know when to say when. Replica jerseys are great, but pairing them with replica pants is going too far. And definitely don't wear white home pants after Labor Day. 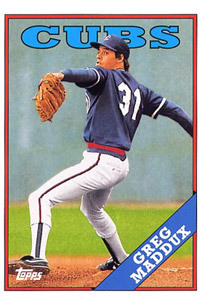 Greg Maddux was about to turn 21 and had exactly eight big league victories when this card (1988 Topps No. 361) was issued. But the reason I highlight this card is not because Maddux went on to win 347 more games and become one of the greatest pitchers in history, but because he wore such high, ribbon-like stirrup socks in this photo. He was by no means alone. Almost everyone still showed plenty of stirrup back in those days. A quarter-century later, almost no player does. As Paul Lukas explains in this classic UniWatch piece, there was a reason for stirrup socks in baseball's old days. There isn't much reason for them now except as a fashion accessory. They might be out of style; but like virtually everything else, it's only a matter of time before they come back into vogue. St. Louis starter Shelby Miller (9 IP, 1 H, 0 R, 0 ER, 0 BB, 13 K) and Boston starter Jon Lester (9 IP, 1 H, 0 R, 0 ER, 0 BB, 5 K) each threw one-hitters on Friday night. Cardinals starter Adam Wainwright took a no-hitter into the eighth inning en route to a two-hitter on Saturday (9 IP, 2 H, 0 R, 0 ER, 1 BB, 7 K). And White Sox starter Chris Sale threw a one-hitter on Sunday (9 IP, 1 H, 0 R, 0 ER, 0 BB, 7 K). Meanwhile, Milwaukee starter Hiram Burgos didn't throw anything close to a one-hitter on Saturday when he allowed 12 runs in three innings (3 IP, 11 H, 12 R, 10 ER, 3 BB, 2 K). And Tampa Bay starter Alex Cobb had a most remarkable game on Friday when he struck out 13 batters -- including four in one inning -- despite recording just 14 outs (4 2/3 IP, 5 H, 3 R, 3 ER, 2 BB, 13 K, 1 HBP, 1 WP, 1 balk). How does a reliever throw zero pitches when baseball rules clearly specify that a pitcher must face at least one batter when he enters a game? Good question. And it still defies explanation that umpire Fieldin Culbreth allowed Houston manager Bo Porter to replace Wright with Hector Ambriz before Wright threw anything but warm-up pitches. Umpires are human. They make occasional mistakes, even when provided slow-motion replay from multiple camera feeds. (Yes, I mean you, Angel Hernandez.) But to not know the rulebook, to not know a basic rule that is understood by almost everyone inside the game? That is simply inexcusable. Baseball suspended Culbreth for two games and fined the rest of his crew, but the punishment should have been more severe. Perhaps working a month in the Carolina League would help that crew brush up on the rulebook. We can't expect our umpires to always make the correct call, but we must demand that they at least know the rules. Then again, his perfect game was against the 2012 Mariners. That baseball is a game of incredible highs and lows, ups and downs, success and (usually) failure is best demonstrated by the past imperfect year in Philip Humber's life. He threw a perfect game against the Mariners on a warm weekend afternoon last April, but he's gone 4-12 with an 8.03 ERA since then. Last week, he lost his spot in the rotation with the Astros, who then designated him for assignment after he allowed five runs in a third of an inning on Saturday. It's a tough game. You could call it "Field of Schemes." I enjoyed Baz Luhrmann's grandiose "The Great Gatsby," which was released last weekend. Some say Luhrmann went too far over the top (as usual); but for me, he brought the Roaring '20s excess and F. Scott Fitzgerald's characters to brilliant life. The party scenes were so deliciously decadent that the only thing missing was Babe Ruth performing a keg stand. Baseball, in fact, does make a cameo in the brief scene where Gatsby introduces Nick Carraway to Meyer Wolfsheim and informs him that the gambler fixed the 1919 World Series. If Luhrmann needs an idea for a follow-up, might I suggest a prequel in which we see Jay Gatsby amassing his fortune by helping Wolfsheim fix the series? Build it and Daisy Buchanan will come. Sharp-eyed fans probably noticed the big clues in this fragment -- a home run for Brett and the loss for Gossage -- and guessed the box score is from the infamous Pine Tar Game of July 24, 1983. Unlike the blown home run call in Wednesday's Oakland-Cleveland game, the Pine Tar protest was upheld and the game was replayed from the point of the protest. There is one very key difference, though, between the Pine Tar Game and last week's disputed home run. When George Brett was initially ruled out after his home run for having excessive pine tar on his bat, he was the final out of the game. So when American League president Lee MacPhail reversed the call, there was nothing to undo, which made things a lot less complicated. They just picked things up after Brett's home run and finished the game.